Q: What is the IOA Corporate 5k? A: IOA Corporate 5k is a 3.1 mile run and walk through downtown Orlando that serves as a celebration of work place fitness. A: Any group of individuals who come together under a company or organization name. For profit and non-profit organizations of all sizes participate for fun, fitness and team building. Q: Can I walk in the IOA Corporate 5k? Q: Can I participate if I'm not affiliated with any company or organization? 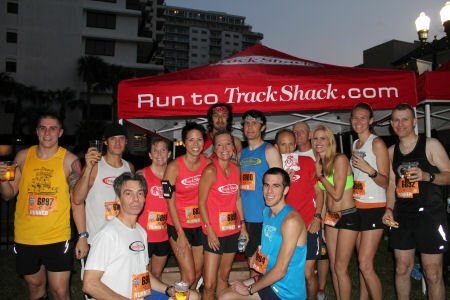 A: Yes, you can register under the umbrella of Track Shack Fitness. Click Register, Join a Team and click on "Track Shack Fitness" and proceed with the registration process. Q: How do I keep up to date on IOA Corporate 5k? Q: Is there an event beneficiary? A: The Track Shack Youth Foundation - a 501 ©(3) organization that promotes health and fitness by funding youth athletics and sports programs through a grant application process. A: Yes, you can register with Track Shack Fitness. This allows unaffiliated individuals to participate but there is no meeting spot or tent on race day. Q: I can't participate, can I get a refund? A: No. The registration fees are non-refundable; We do allow you to transfer your registration to a friend, family or co-worker. Q: Why would my company rent a Team Tent? A: Companies rent tent for hospitality as a way to entertain employees, clients and/or vendors. Q: How do we rent a team tent? A: Create a team and reserve your tent online through the products page. Q: May we bring our own team tent? A: No, team tents are available for rental only. All others will be removed. Q: Our team has a team tent. How do I find it around Lake Eola? Q: May we hang a banner in our team tent? A: Yes, one banner is allowed but must fit within tent. Q: May we bring a grill? Q: What does it mean to "seed runners"? A: To position fast runners (i.e. finish under 25 minutes) in a reserved, corralled area at the very front of start line. Captains may "seed" 10% of their participants (i.e. 45 participants = 5 seeded runners), up to a maximum of 25 runners. Q: How are runners seeded? A: When the Team Captain picks up the team's Race Pack (t-shirts, race #'s, etc.) at Track Shack, race staff will offer wrist bands to be given to the seeded runners on their team. Only those runners who wear the wristband will be allowed in the "seeded corral" at the start line which is indicated by signage, barriers and volunteers. Seeded runners receive a red wrist band. Q: How is a team scored? A: After the race, team members report their finish time, exactly as it appears on the finish line clock, to their Team Captain. The option to submit results and team scores will appear in the Team Captain Tools after 6:45 pm on race night.The captain tools are mobile friendly! Q: Who is eligible to score on a company team? Any registered participant who is a full time employee and who works for the company / organization for a minimum of 32 hours per week and employed with organization for at least 3 months. Q: What is the deadline to submit results? A: Team Scores must be submitted by 12:00 pm (noon) on Friday, April 14th. Q: What are the scoring divisions? A: Mens', Womens' and Coed teams area awarded in 18 industry categories. 4 individuals on each team. Q: When & where will results be posted? A: Industry category results will be posted on www.Corporate5k.com the next business day. Q: Who is the CEO? A: The most senior full-time employee of a company with four or more full time employees. A person does not necessarily need to hold the CEO title (i.e. President, Owner, etc). There is only one CEO/ team. A CEO must submit his time to the team captain. A: We recommend arriving at Lake Eola by 5:15 pm pm due to the large crowd and race time (6:45 pm). A: Twenty parking garages in downtown Orlando have been identified on the Parking Map. Other suggestions include using side streets, car pooling and walking together from downtown office buildings. A: IOA Corporate 5k starts on Central Blvd heading east. Q: Where do the runners line up? A: Runners (wearing orange bib numbers) will line up on Central Blvd. Watch for signs to the Runner Start lineup! Q: Where do the walkers line up? A: The walkers will line up on N. Eola Drive. For the safety of all participants, runners and walkers will be directed to separate start areas. Watch for signs to the Walker Start lineup! Q: Where do we drop off my canned food item for Christian Service Center? A: Three drop off locations will be set up: 1) On Rosalind Ave. near the Amphitheatre and 2) Eola Drive (Panera side). Q: What post-race refreshments are provided? A: Water and a small snack will be available for all participants. Each participant receives one complimentary Michelob Ultra coupon on their bib number. Q: Is there Lost & Found? A: Located at the Info Tent in Red Zone. A: Medical support will be present in Lake Eola Park at Information/Scoring tents, on course and the finish line.